We remain on track to complete the new Midtown in July 2017 and appreciate your understanding and patience as we continue to do everything possible to make your Midtown experience enjoyable during construction. Beginning today, June 6, we will temporarily relocate the walkway between the Parking Garage and the Main Building to allow for construction of the new club foundation. We expect this work will be complete in one week, at which point we will return to the original walkway configuration. 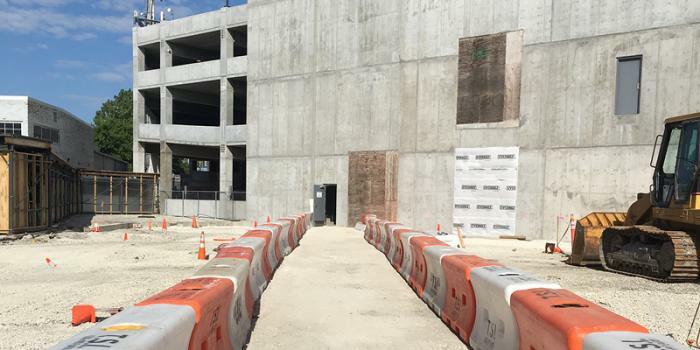 The temporary walkway begins in the stairwell on the first level of the Parking Garage and entrance to the Main Building will be at the opposite end of the fitness and training area. For convenience, directional signage will be posted and Midtown associates are available to assist. The city has made notable progress on the road construction project. The final concrete pavement for the Elston Avenue reroute is starting to take shape. Road construction on Fullerton is expected to clear by mid-June through Labor Day as all permanent lane closures will be removed. Also, the new Elston alignment will open to traffic in August. Thank you for being a Midtown member, and please contact me at Michael.Mahoney@midtown.com with any questions. Michael Mahoney is the General Manager at Midtown Athletic Club in Chicago and has worked for Midtown Athletic Clubs for over 35 years. A past president of the Chicago District Tennis Association, the Chicago arm of the United States Tennis Association, Mahoney is certified by both the Professional Tennis Registry and Unites States Professional Tennis Association and is a graduate of the University of Rochester.